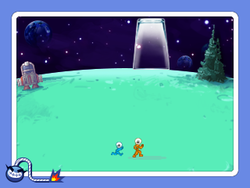 Mars Jars is a microgame in the Sci-Fi folder in WarioWare, Inc.: Mega Microgame$! and returns as one of Dribble and Spitz's microgames in WarioWare Gold. 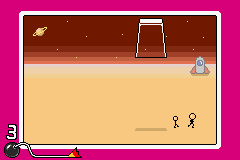 There is a character on Mars, followed by smaller ones, of which the amount depends on the difficulty. Above them, there is a large cup moving back and forth, which then falls down in an attempt to capture them. The player must control the character with the , and avoid the cup. If even one man gets captured, the game is lost. 1st level difficulty: There is one small man. 2nd level difficulty: There are two small men. 3rd level difficulty: There are three small men. This page was last edited on April 10, 2019, at 22:22.